Looking for a heavy duty watch that can take a beating and keep on ticking? The Invicta Subaqua Chronograph (0653)may be just what you need. This subaqua series, chronograph style watch, has been crafted from stainless steel and polyurethane to keep it going a strong. 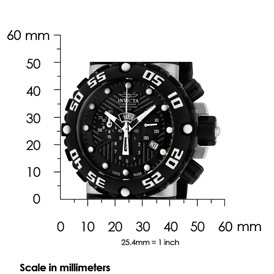 This Subaqua’s case is made of stainless steel and measures 50 mm wide, 50mm high, and 20mm thick. Its dial is made with Invicta’s trademark flame fusion cyrstal. This makes the watch far more impact resistant than most. Its dial is black with silver tone hands and textured with slanting gray lines to form a lattice design. The time is displayed with white orbs aligned to each hour. The hour, minute, and sub-dial are luminous, making the watch easily readable even in low light conditions. A black, polyurethane strap – measuring is 30mm wide – gives the watch a comfortable fit. It is reinforced with stainless steel inserts and screws. A stainless steel buckle clasp finishes it. The outer bezel is made of the same polyurethane as the strap. It has a block-shaped and white Arabic numerals (in sets of five from 5 to 55) framing the watch. The Subaque has a Polyurethane Strap which gives it a comfortable and durable feel. Besides the trendy black and silver tones color scheme, its swiss quartz movement ensures you see the precise time all the time. What’s more, this chronograph measures up to thirty minutes of activity in 1/10 second intervals. The timepiece also provides convenient date display (positioned at the fourth hour) and a day display (in the center of the dial). 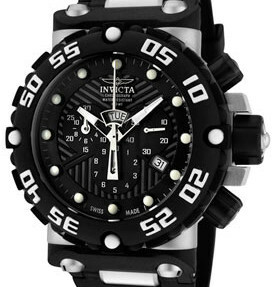 The Invicta Subaqua Chronograph (0653) ranges from $450.00 on World of Watches to $238.60 on Amazon or Newegg. The Case Measures 50X50mm and is 20mm thick. While the Invicta Subaque (0653) can physically go anywhere, its looks may be somewhat limiting. This is not the kind of watch you wear just anywhere. For instance, while it’s perfect for the gym or an outdoor excursion, it would look terribly out of place with a suit. It would be especially awkward on a smaller wrist, where the large case and thick strap can look rather bulky. That said, the Subaque does a very good job as a sports watch. The Invicta Subaque’s swiss quartz movement assures you will see the precision time every time, while Invicta’s trademarked flame-fusion crystal makes the watch far more impact resistant than most watches. It’s polyurethane strap allows for a comfortable and flexible fit perfect for active men. The strap is secured with an easy-to-grip stainless steel buckle, making the watch easy to pull on or off. 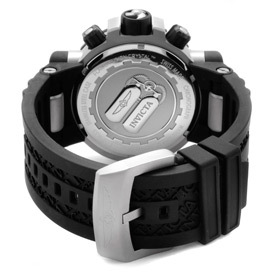 Additionally, the Invicta Subaqua (0653) is water resistant to 100 meters. So you can strap it on and go without worrying. This watch is designed to last. Whether in the gym or out in the field, its ready for any sport, the Invicta Subaque Chronograph (0653) is well designed for the active lifestyle. It’s durability and relative comfort make it an easy choice for weekend excursions or trips to the treadmill. Now, if you’re looking for a versatile watch that’ll match your more formal wear as well, this isn’t it. 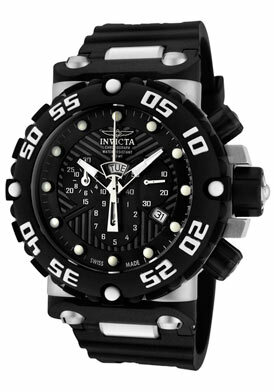 But if you want something that can take a beating and keep on ticking, the Invicta Subaqua is the watch for you.